Most people are familiar with the term "Uncommon Valor". It refers to when an ordinary person is faced with extraordinary and sometimes horrific circumstances but rises above those circumstances to display unprecedented courage. The term has mostly been linked to soldiers in war. The reason this book is titled Common Valor is simple. The firefighters whose stories are told within these pages are also ordinary people who have performed boldly under the most difficult of circumstances; however, among the fire service these stories are common. Stories such as these can be found anywhere. It has been said that, "at every working fire there is an invisible wall that separates reason from insanity. A firefighter's job is to find a way to break through that wall in order to do the job that lies ahead." 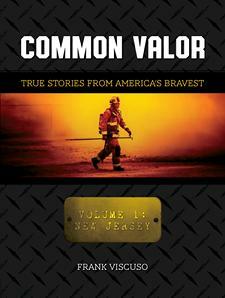 Common Valor, True Stories from America's Bravest (Vol. 1), features powerful first-hand stories about individuals who have done just that. What people are saying about Frank Viscuso's book "Common Valor"
Excellent read. While I was captivated by the heroics, I found myself picking out the nuggets of wisdom in the stories and filing them away. It was ironic to then reflect on what the author wrote about in the conclusion. Common Valor isn’t a textbook, but the lessons in it were beyond valuable. Thank you Chief Viscuso for so selflessly contributing so much to our profession. "Frank Viscuso's Common Valor is a compelling collection of stories focusing on intense firegrounds and dramatic rescues by firefighters from sixteen New Jersey fire departments. We at DMC Associates Books think Common Valor is a truly terrific book by a talented new writer, and an important addition to the chronicles of America's firefighter." "In Common Valor, Captain Frank Viscuso describes the firefighting world as only a firefighter can. The descriptions of these moving stories depict the life and death struggle of firefighters from New Jersey, who are often understaffed, but equal to the task of saving life each and every day. Viscuso captures the human emotion and drama from firefighters who have endured a wide range of firefighting and rescue scenarios. The author goes way beyond the stories that the public may hear about. With Common Valor, you live it. From these dramatic descriptions you can feel yourself right there, up close with the rescuers. From seeing brother firefighters die to being caught in a flashover and living to tell about it, this book goes far beyond the norm, it captures true spirit and camaraderie of this special breed of firefighters. Common Valor says it all." "Frank Viscuso of the Kearny Fire Department has created an outstanding book. In addition to serious incidents within his own department, he has included many others, involving members of sixteen different fire departments, both professional and volunteer, throughout the state of New Jersey. These stories are not limited to fire fighting, but to a wide range of hazardous activities, including horrendous vehicle accidents, river rescues, and other major operations. It is clear that he possesses great fire fighting knowledge and experience. When this is combined with his exceptional ability to describe in detail, the heroic activities of so many outstanding members of the fire service along with the compassion and humor which is typical of those in our profession, the result is a valuable contribution to the history of the fire service and a most enjoyable reading experience." Leo D. Stapleton, Former Boston Fire Commissioner, and author of several fire related books which include "Commish" and "Jakes"
"Common Valor speaks to the very essence of the fire service. You will read about true acts of heroism, laced with compassion for victims along with the overriding sense of family for brother and sister firefighters. You will read about how they save us from harms way without regard or reservation to their own personal safety. Every day, in all kinds of weather and under the most horrific conditions imaginable. Firefighters do it because it has to be done. Not for money or glory, but quite simply because in their own words, "it's the best job in the world" - There's nothing common about that." "Some stories in Common Valor make the heart skip, others vividly testify to the horror of fire, still other stories show the unknown every firefighter faces. Viscuso also writes in stirring dialogue about the worry and sacrifice of families who live with and love firefighters. His stories aren't only about firefighting, the book is also about the losses firefighters suffer when they've done everything they could, and it's still not enough." "Frank Viscuso did his homework in interviewing the personnel involved in Common Valor. His stories are covered in such vivid detail you would think that he was alongside the person or persons involved in the thick of the incident, with a pad taking notes. Each story keeps you on the edge of your seat. If you are a firefighter from a small town whether volunteer or paid, this book will allow you to hold your head up high because it is a testimony to laypeople that there are heroes in every department (everywhere). This is a book we firefighters can be proud of and is an excellent gift idea to help the public know what it is to be a (firefighter). If you are a mentor to any young person aspiring to be a firefighter, Common Valor is an excellent source of encouragement for them. I believe this is the first of many similar books to come from this author! Keep up the good work brother!" "Gripping accounts of triumph over uncertainty. (Common Valor) is great reading and would also make a great gift. The accounts are easily understood by non-firefighter readers." Order your copy of Common Valor today!